The Farmer’s Daughter at The Country Farm Home has shared a look of her cottage style bathroom decor. 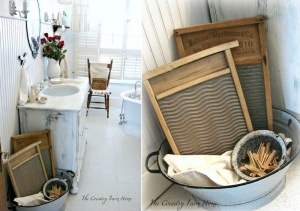 She has put two old washboards inside an old washtub along with clothespins to create a cool display. Courtney Carmean at A Diamond in The Stuff has shared the wall decor idea for her laundry room. 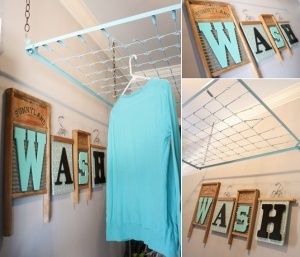 She has re-purposed two washboards with two wooden hangers to craft this wall art that says ‘Wash’. 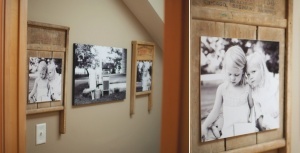 Country Living has shared a wonderful way to recycle old washboards into frames for displaying your family photos. Christin Bjørnrud at Pinterest has shared a fabulous idea for those who have a green thumb and would like to have a potting bench in their garden. 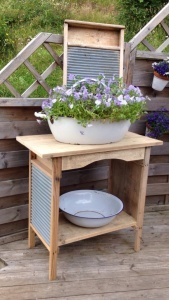 Simply recycle two or more washboards and create a small potting bench like this one that you can use during gardening. Jeanne at Bees Knees Bungalow has shared a cute idea for a laundry room. 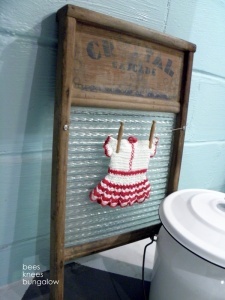 She has displayed a doll dress on a clothing line with miniature clothespins that is fixed on an old washboard. 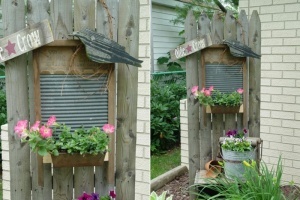 Sweetpeas Primitives blog has shared a garden decor idea where a flower box is attached to an old washboard to create a beautiful garden accent. 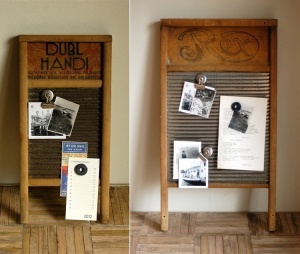 Bonnie via Etsy has shared a way of recycling a washboard into a memo board. This board can be great for an entryway.